Every year on Opening Day, each school comes with their own school shirt–all different colors with that year’s theme or focus for their individual building. It’s not officially a competition (because of course everyone knows Robinson would win for the coolest shirts every time! ), but there’s definitely pride for your school and the teachers with which you work. This year was different, though, as the whole district come together with just one shirt. One Kirkwood. As we start a new school year, with many uncertainties and possibilities, it’s more important than ever that we are united. That we are all working toward the same goals. And seeing everyone in the same shirt definitely helped visually remind us of that unity. The same is true with my teaching team this year. Now of course, there is always a level of “oneness” among the team–we have the same curriculum goals, for instance–but this year we’re taking that to a new level. We are making it our goal, from day one, that every kiddo in our 5th grade knows that they have many teachers, many people to care for them, support them, and help them achieve their best. We’re considering all these fabulous new kiddos OUR kids, rather than MY kids. This year we’re intentionally including ALL the members of that team–including interventionists, teacher assistants, instructional specialists and special education teachers–in our community building, introductions, class activities, etc. We are all working together to help make EVERY kiddo in ALL of our classes successful. Together. 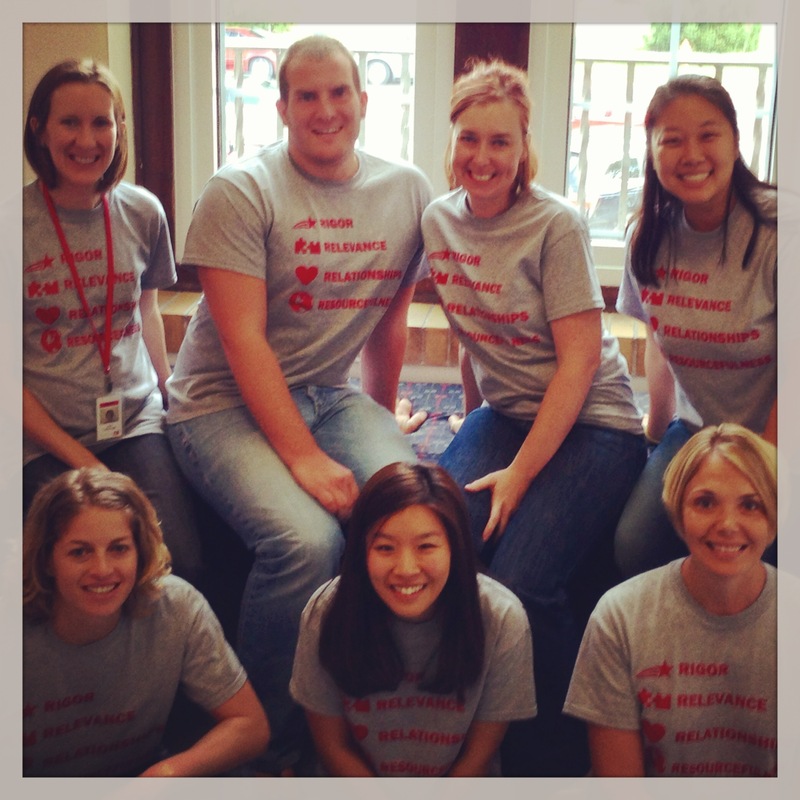 Our FABULOUS 5th Grade Team–Mrs. Cheatham, Mr. Shelton, me, Mrs. Hong (back); Ms. Turken, Mrs. Jeon and Mrs. Bell (front) Mrs. Sondermann, Mrs. Meihaus, the special area teachers and our amazing TAs are not pictured, but still a CRUCIAL part of our team, too! Posted on August 14, 2013 by Jen Bearden	• This entry was posted in Classroom and tagged Kirkwood, Robinson, team, united. Bookmark the permalink. This made my day! We CAN do it!